I am creating a "HelloWorld 2013" app in Visual Studio 2012 that deployes to my on-premises developer site. The app deploys to the site with no problems. My goal is to change the app icon (for example, the icon that displays in Site Contents). There appears to be 2 places in my project to spcify the app icon image neither of which appear to make a difference. The picture I am selecting for the icon is 96x96px .png or .ico (as required) and located in the images folder of my project. 1) What is the difference between setting the icon in these 2 locations? 2) What else should I change so that my specified image shows as the icon for the app? NB Going on the premise that there is a relatively uninvolved way to change an app icon without going through custom branding. Very similar to my question but the only resolution is "I have got the icon displaying for app"
for your #2, When on AppManifest.xml, chose your icon using the ellipsis(...) and make sure it's in the format HelloWorldSPHostedApp/Images/AppIcon.png , provided your icon's image is under Images module of the project. Once the app is installed, your icon should appear. 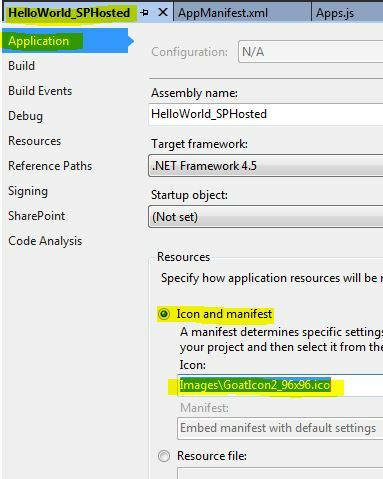 Setting an icon in the project properties is where you could set the icon for a Windows application, it has no impact on an App for SharePoint. 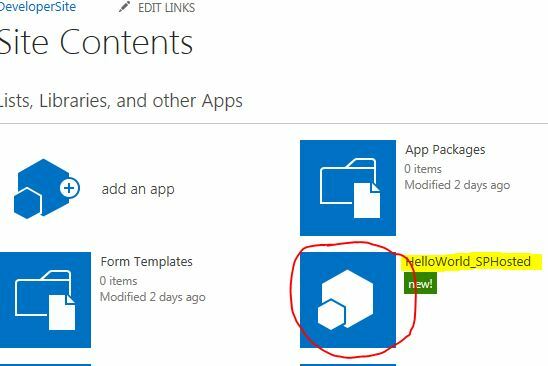 When you create a new App for SharePoint project, it includes an AppIcon.png file already. The simplest thing to do would be to replace that existing file with the one you want to use. Alternatively, add the new PNG to the project and then simply select it by clicking the ellipsis on the AppManifest.xml file for the Icon property. All this requires is that the image be a part of the project, not located somewhere else. Not the answer you're looking for? Browse other questions tagged 2013 sharepoint-addin visual-studio-2012 or ask your own question. 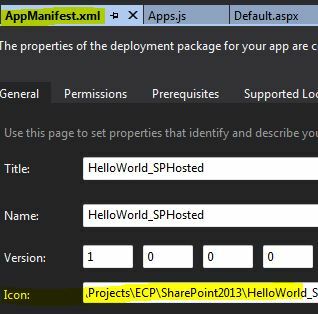 How to Create Apps for SharePoint 2013 in Visual Studio 2012?